In Book 2 of Mahabharata, the Pandavas agree to spend 13th year of their exile incognito. Virata Parva describes their efforts at living under concealed identities (shown above), traumas and adventures. Virata Parva, also known as the “Book of Virata”, is the fourth of eighteen books of the Indian Epic Mahabharata. Virata Parva traditonally has 4 sub-books and 72 chapters. The critical edition of Virata Parva has 4 sub-books and 67 chapters. It discusses the 13th year of exile which the Pandavas must spend incognito to avoid another 12 years of exile in the forest. They do so in the court of Virata. They assume a variety of concealed identities. 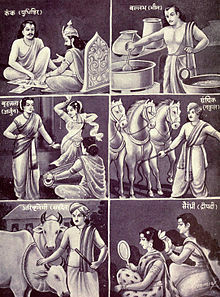 Yudhishthira assumes the identity of game entertainer to the king and calls himself Kanka, Bhima of a cook Ballava, Arjuna teaches dance and music as enuch Brihannala and dresses as a woman, Nakula tends horses as Granthika, Sahadeva herds cows as Tantipala, and Draupadi maids as Sairandhri to queen Shudeshna. The Pandavas discuss ways they can each conceal their identity for one year, and thus meet the pledge they made at the time of their exile. While Pandavas have grown up in a princely family, they must now assume non-princely professions to avoid being detected. If they are detected, the terms of their exile pledge would extend the exile by another 12 years. Yudhishthira assumes the name of Kanka, Bhima of Vallaba, Arjuna dresses up in a saree and assumes the name of Brihannala, Nakula as Granthika, Sahadeva as Tantipala, and Draupadi as Sairandhri. The parva describes Pandavas' life as workers in Virata's kingdom, with king Virata as a famous cow baron. Maid Sairandhri (Draupadi) is humiliated in Virata's court by Kichaka (left) in the last month of the 13th year. Bhima kills Kichaka. Kichaka, the commander of king Virata's forces, sees maid Sairandhri (incognito Draupadi), lusts for her. Kichaka approaches the queen, and inquires about Sairandhri. The queen does not know the true identity of Sairandhri, and arranges a meeting. Sairandhri informs Kichaka that she is married, and his stalking of her is inappropriate and against Dharma. Kichaka offers her release from being a maid and a life of luxury. Sairandhri says it is wrong for him to continue pursuing her. Kichaka gets desperate, desires Sairandhri even more. Queen Shudeshna asks Sairandhri to go get wine for her from Kichaka's house. Sairindhri goes in fear to Kichaka house to get wine. Kichaka meets her there, tries to molest her, Sairandhri pushes him and runs to the court of king Virata. Kichaka chases her, catches and kicks her in the court of Virata in front of the king. Sairandhri (Draupadi) demands justice from the king. Virata and Kanka (Yudhishthira) console Sairandhri, promise due investigation of all facts and then justice. Sairandhri, upset with her humiliation, the delay in justice, scolds both the king and Kanka. The queen learns about the mistreatment of Sairindhri, promises death to Kichaka. Draupadi meets Bhima, describes her humiliation by Kichaka, as well as how frustrated she has been with the 12 years of exile, for suffering the vice of her husband Yudhishthira. Draupadi explains why Kichaka is evil, explains she repeatedly rejected Kichaka, and demands Kichaka's death. Next day, Kichaka again approaches maid Sairandhri, and harasses her. Sairandhri asks him to meet her at a hiding place. Bhima meets Kichaka instead, and kills Kichaka. Friends and family of Kichaka blame maid Sairandhri, for Kichaka's death, catch her and try to burn her to death. Bhima gets upset, attacks and kills all those trying to burn Sairandhri. Draupadi is saved. The story presents the interconnectedness of crime to people related to the victim and the perpetrator, their emotions and how people take sides. Kichaka story from the Mahabharata is one of those that is dramatized in Indian classical dances, such as Kathakali. Prince Uttara, with the help of Arjuna, defeats the attack by the army of Kuru brothers. He returns to his capital with wealth and cows that were looted from Matsya kingdom. This story is recited in Go-grahana sub-book of Virata Parva. The evil Dhritarashtra and Duryodhana disclose their spies have been looking for Pandavas in forests, villages, provinces and cities, unsuccessfully. Two more weeks are left of the 13th year of exile. Karna suggests they hire more competent spies, fan inside their kingdom, in holy places among ascetics, and in distant kingdoms. Drona recommends that instead of sending spies, Dhritarashtra should seek peace and welcome the Pandavas. Bhishma agrees with Drona, counsels Dhritarashtra to find the brothers where they are likely to be and bring them back. Bhishma speculates that the good and high souled people like Pandava brothers always create prosperity, peace, cheer and health of all creatures wherever they go. Look for them in places where prosperity and cheer has recently increased. Kripa agrees with Bhishma speculation, but suggests Dhritarashtra to prepare for war to kill Pandavas, as they are likely to be weak and without soldiers at the end of the exile. Susharma, the king of Trigartas, present during this discussion, suggests Virata kingdom fits this profile. Susharma recommends an attack on the Virata's kingdom of Matsya, seizure of its wealth of kine (cows) and recent prosperity. The army of Susharma attack Matsya, loot his kine and wealth, take king Virata captive. Bhima recommends immediate retaliation and war. Yudhishthira recommends caution and careful response. Pandavas join the war. Bhima frees Virata, takes injured Susharma captive. Yudhishthira recommends that Susharma - the prisoner of war - be forgiven and freed, not killed. Virata, accompanied with Yudhishthira and Bhima, leaves his kingdom to bring back the kine and wealth from Susharma. In Virata's absence, Duryodhana and his army attack Virata's kingdom of Matsya. Prince Uttara, the son of Virata, attempts a response, but is afraid of war. Arjuna becomes the charioteer of Uttara. Uttara and Arjuna enter the war. The parva then describes several battles, between Arjuna and Karna, Arjuna and Kripa, the battle of Ashwathama. Arjuna defeats the entire army and then invokes the hypnotic weapon against Duryodhana, Ashwathama, Kripa, Karna, Drona and Bhishma. In this parva Arjuna proves himself as the greatest archer in mahabharata.Everyone falls unconscious except Bhishma. Bhishma smiles and retreats. Prince Uttara returns victorious with wealth and Arjuna. Arjuna discloses to king Virata that he and his Pandava brothers have been in his kingdom in disguise, over the 13th year of their exile. Virata's daughter princess Uttarā marries Arjuna's son Abhimanyu. Several translations of the Sanskrit book Virata Parva in English are available. Two translations from 19th century, now in public domain, are those by Kisari Mohan Ganguli and Manmatha Nath Dutt. The translations vary with each translator's interpretations. J. A. B. van Buitenen completed an annotated edition of Virata Parva, based on critically edited and least corrupted version of Mahabharata known in 1975. Debroy, in 2011, notes that updated critical edition of Virata Parva, with spurious and corrupted text removed, has 4 sub-books, 67 adhyayas (chapters) and 1,736 shlokas (verses). Debroy's translation of a critical edition of Virata Parva appears in Volume 4 of his series. Clay Sanskrit Library has published a 15 volume set of the Mahabharata which includes a translation of Virata Parva by Kathleen Garbutt. This translation is modern and uses an old manuscript of the Epic. The translation does not remove verses and chapters now widely believed to be spurious and smuggled into the Epic in 1st or 2nd millennium AD. Abhimanyu marries princess Uttarā in Virata Parva. Their story is often displayed in traditional Wayang (puppet, pop and theatre) in the Hindu culture found in Bali and pockets of Java, Indonesia. A wise man should never contract friendship with the wife of the king nor with other attendants of his, nor with those whom he despises and who are hostile to him. Tell me, O lady, who is this bewitching girl of fine beauty, endued with the grace of a goddess, and whose she is and where she comes from. She has brought me to subjection by grinding my heart. I think there is no other medicine to heal me, except her. That wicked-souled Kichaka is war like, proud, outrager of female modesty and engrossed in all objects of pleasure. He steals money from the king. He extorts money from others, even if they cry in woe; he never stays in paths of rectitude nor does he even feel inclined to virtue. He is wicked-souled, of sinful disposition, impudent, villaneous and afflicted by Cupid's shaft. Although I have repeatedly rejected him, he will, I am sure, outrage me, whenever he happens to see me. Uttara said: Let the Kurus take away the profuse riches of the Matsyas as they like; let men and women laugh at me, O Vrihannala. Let the kine go any where, let my city be desolate, let me fear my father, but I shall not enter into battle. Vrihannala said: To fly is not the practice of the brave; death in battle is preferable to flight in fear. This page was last edited on 8 January 2019, at 20:36 (UTC).